Was It Revised? : Yes, in 1967 by Tom Mulvey, one of five he did and the first since What Happened at Midnight and The Great Airport Mystery. Cover: Rudy Nappi, red as always but the yellow is the sky and house. Frank and Joe are not hidden and watching something, they are confronting a guy waving a machete! Uh oh, are we in for more Latino stereotypes? Nope, Mr. Mulvey resists that temptation for the most part. The Mexico people are nuanced here. At least we see that mark on the door. Setting: Bayport and Mexico. Mostly Mexico. This is Frank and Joe south of the border. Where’s Fenton This Time? : Oh he’s around for the beginning as it’s his idea for the boys to join him in Mexico — and he even suggests Chet come along too for no obvious reason whatsoever. Then he dutifully disappears for the bulk of the book, only to show up WITH AN ARMY at the end, as usual. I mean, we got helicopters and everything at the end. This is a James Bond ending. Which Chums Show Up? : Chet, the third musketeer. Jack Wayne shows up prominently again, not only to get them to Mexico and back, but also some nifty flying in country. What’s Chet’s Hobby This Time? : Ain’t got none. Aunt Gertrude’s Dessert: She made an apple pie. She’s warming up in this series. Plot: A sub is spotted near Bayport (because of course it is), and a connection is made to Mexico. 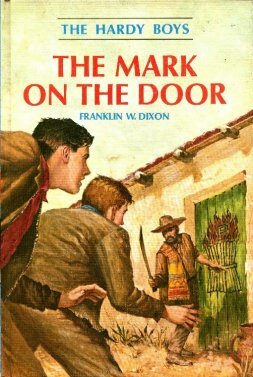 Off they fly and a search gets underway, but nobody wants to talk because of the mark on the door. Review: Not a big fan. It’s Frank and Joe touring the Mexican countryside trying to solve a mystery nobody will talk about. What on earth is so vital that lives are at stake? When we finally find out what the plot is, we can’t believe so much effort went into so little. Seriously? The bad guy threaten people’s lives over this?! He goes through that much effort for yet another scam when there are plenty of jewels in Bayport to rob like every other crook? There have to be easier ways to make a living! That said, there is one absolutely terrific sequence where the boys are trapped on board the submarine and they have to escape. How they do it, and the bravery and leadership Joe shows in the process, are top notch. It’s Joe as James Bond, and I ain’t kidding. Hey, Mr. Mulvey rewrote this in 1967, and that was near peak publicity for James Bond. He got ideas . . .